Bold Colors. Make it POP. Ever bought an accessory or piece of furniture that blended perfectly with your room’s color palette, only to find it bland and boring once you got it home? Or better still, have you ever felt dissatisfied after choosing a neutral color instead of a fun one, because you were too afraid to be daring? Of course you have. We all have. Choosing bold colors can feel…well, downright scary. But don’t allow what seems like a risky decision to paralyze your creativity. Whether you choose a large or small dose of daring, be brave with color! Regret isn’t in the taking of a chance, it’s in the not taking. Embracing one’s creativity is a paradigm of life itself. 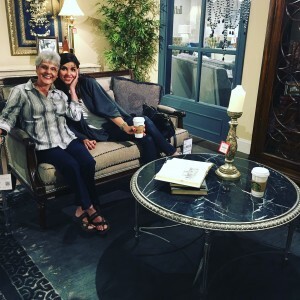 A few weeks ago, I had the great adventure of taking my mom and niece furniture shopping in North Carolina. So much fun!!! My mom, who we call JuJu, needed to furnish the little cottage she and my dad are building in our backyard. And my niece, Dennon, needed to refurnish her entire home, compliments of the South Louisiana floodwaters this summer. I love these two ladies with all my heart, and I know them both as well as I know the back of my own hand. So I was aware JuJu would try to play it safe, leaning towards neutrals rather than the bright colors she truly loves. And Dennon would gravitate towards a monochromatic color scheme, because she’s inspired by transitional decor. It was a Girls’ Trip destined to cast all of us from our comfort zones. “What are your favorite colors of the rainbow?” This was the question I posed to my mom. (And likewise, this is the question I pose to you.) JuJu required a couple of days to remember which colors she’s always loved, but to her surprise, blasé beige (aka safe neutral) didn’t even make her short list. 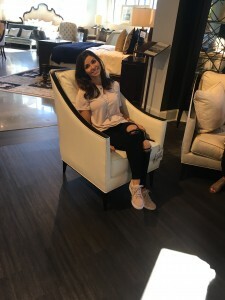 In light of remembering which colors make her the happiest, JuJu’s new living room will be dressed with a rich green sofa, hot pink throw pillows, and royal blue velvet arm chairs. 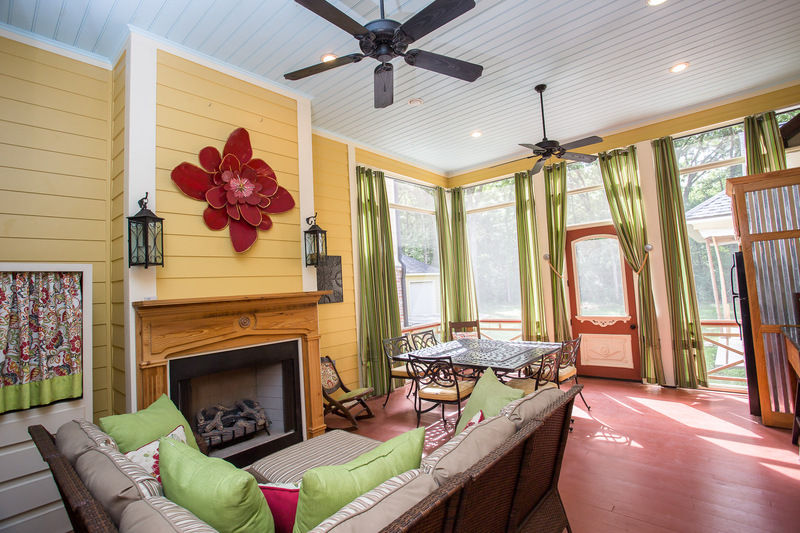 By working with bold colors, her cottage will reflect the dramatic feel of The French Quarter. The inside elements will now compliment the outside façade of her new retirement cottage. And most importantly, the colors my precious JuJu loves best will greet her everyday. 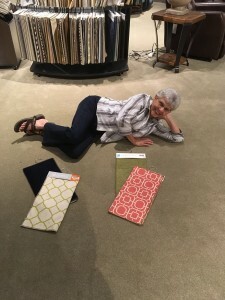 A favorite design hero of mine, Bryan Batt, said it best— “If you really want someone’s attention, try whispering; if that doesn’t work, then sing out loud.” JuJu is a singer! Dennon, on the other hand, is a whisperer. She wants little to do with bold color schemes, and I respect that. Her mind absorbs colors singularly, one at a time. When I think of color, my mind goes to a flamboyant Jazz Band marching through the streets. I see white napkins being waved overhead and neon umbrellas being twirled all around. I hear trombones and loud music. But when Dennon thinks of color, her mind goes to a white sandy beach and a bright orange sun settling behind the horizon of a pale blue sky. She hears the calm crash of waves, and little else. Her version is such a soft, quiet, serene take on the same colors of the same rainbow! Two very different visions. But who could argue the beauty in both? Needless to say, Dennon’s living room will not be bright and vibrant. It will be calm and palliative, consisting primarily of whites and grays. A cloud-colored upholstery will cover her sectional sofa. White iridescent fabric will grace her arm chairs. Pillows of bright blue will be scattered about as pops of color. And with such a soothing backdrop, will they ever pop! Remember this bit of advice. Be true to yourself. Trust what inspires you, because these things are in-your-spirit. They are your inspirations. And they’ll never lead you astray. Special thanks and sincere gratitude to Michelle Taylor with Furnitureland South and Anna Mcgaha with Fine Furniture Design. We appreciate your hospitality, expertise, and generosity in making our girls’ trip the memory of a lifetime. You ladies are amazing!